Wolverhampton-based plastics recycler, Recycled UK, has recently installed seven magnetic separators at its processing facility in order to reduce metal contamination in its material streams. 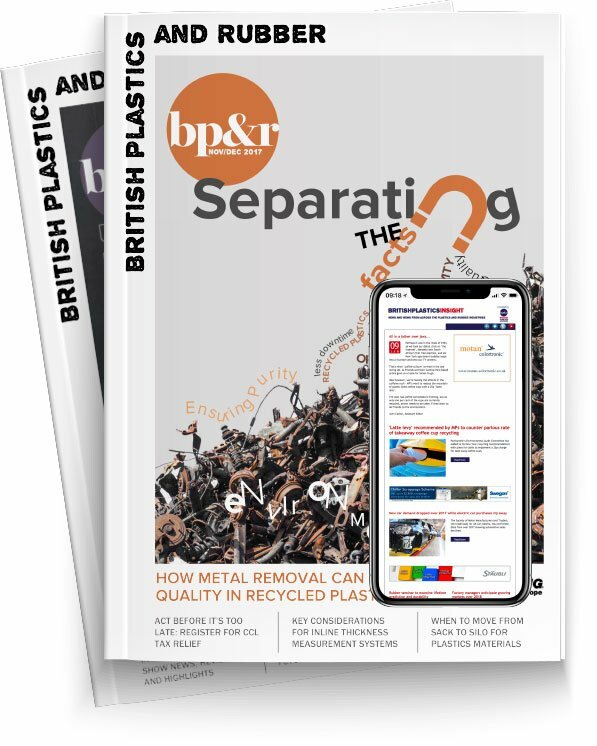 The company, which handles and processes up to 200 tonnes per month of plastics regrind from primary manufacturing and secondary recycling channels across the UK, wanted to solve the issue of metal contaminants causing both production downtime and damage to equipment such as shredders and granulators. Contaminants included both large and small metal bodies passing through the plant, including large spanners, bolts, nails, washers and fine iron. Production Director, Paul Cotton, approached Bunting Magnetics Europe at UK plastics exhibition, Interplas, in September 2014, where the suggestion of installing magnetic separators on new conveyors as a first priority was made. “It was very good timing that we were ready to address the metal contamination problem when we met Bunting at the Interplas exhibition. They came and visited our site soon after the exhibition and quoted us competitive prices that meant the project could go ahead straight away,” Cotton explained. To achieve the best separation, Recycled UK went on to install two different types of magnetic separator. Firstly, on the end of its conveyors, it replaced the standard head drive pulleys with magnetic pulleys. Here, material is conveyed up and into the magnetic field of the pulley where ferrous metal is attracted and held to the surface of the belt. Non-magnetic material continues to fall under its normal trajectory with the captured ferrous metal being held and then discharged into a separate collection bin underneath. The types of metal being removed include long blots, washers, nuts and smaller tramp iron. The magnetic pulley installed has a diameter of 150mm and is 975mm long. Recycled UK also installed four plate magnets of three different sizes. All have flat faces and are high strength rare earth magnet models replacing weaker and older ferrite magnets. The plate magnets have been installed in chutes on the discharge end of conveyors and also suspended over conveyors. The installed plate magnets are even removing and capturing fine iron filings from the conveyed plastic. "Within a batch of recycled plastic there will be problematic metal, which damages equipment and the quality of the end product. Often the end plastic product is unsaleable unless it is metal free. Recycled UK is using relatively simple magnetic separation technology, but it successfully addresses those two problems,” explained Bunting’s UK Sales Director, Carlton Hicks. Recycled UK says that since the installation of the magnetic pulleys and plate magnets there have been no stoppages due to metal contamination. The company continues to invest in the plant to improve productivity and efficiency.